There are certain dishes that have a special place in my heart. This one isn’t a family recipe, but it’s one that I’ve ordered time and time again at a local Italian restaurant in my hometown. 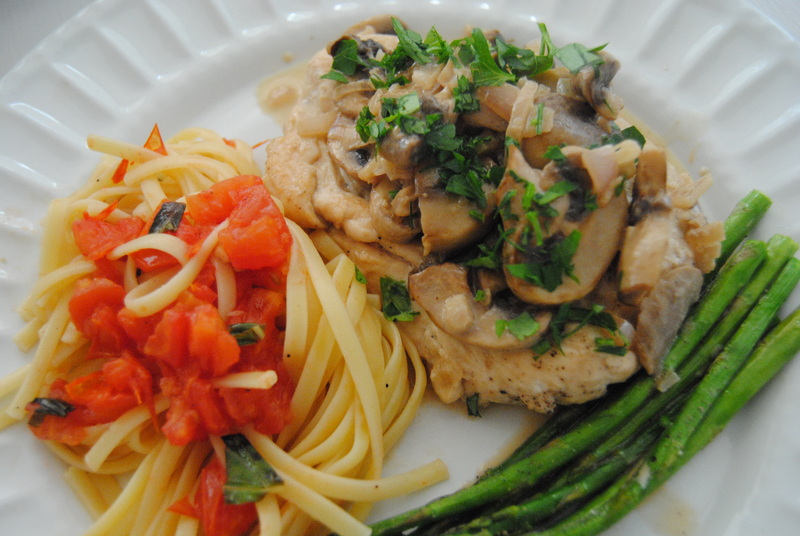 For some reason Chicken Marsala reminds me of home…not sure how an Italian dish can remind me of Florida but it does. This recipe really couldn’t be any easier. You basically sauté chicken cutlets in butter, add in some shallots and mushrooms then make a reduction sauce with marsala wine, cream and a bit of lemon juice. I love that you can use plain ‘ol white button mushrooms in this recipe. These guys are getting upstaged lately by their snobby cousins crimini and portobello. I’m willing to bet money that if you can cook them right, button mushrooms can pull off as much flavor as their fancy friends. Did you know matsutake mushrooms are approximately $1,000 a pound! I should just try and harvest them the next time I’m in Japan and sell them on the mushroom black market. Now don’t spend all your pennies when shopping for Marsala wine. It really won’t make your dish taste any better. Actually it will make it taste very bad. Typically if you find Marsala in a liquor store or wine shop it will be sweet and NOT meant for cooking…I always find mine near the oil and vinegar at the supermarket. Don’t be a dummy and drink this variety. Dry Marsala is a fortified wine, which means it has a spirit added to it and will last for months if you keep it in your pantry. I use mine sparingly, so a large bottle usually lasts me about a year. Score! Tonight chose asparagus and a simple pasta with roma tomatoes, garlic and basil. It would also be good with garlic mashed potatoes or even a simple garden salad. Buon appetito! Melt 1 tbs butter in skillet. Season chicken cutlets with salt and pepper. Cook approximately 2 minutes per side then remove chicken and set aside. Melt the remaining butter in skillet and add shallots and mushrooms. Cook until mushrooms release liquid and are slightly browned. Add in Mrsala wine, bring to a boil and scrape up the brown bits. Add in lemon juice and cream. Simmer for 5 minutes. Add in chicken breasts and simmer another 4 minutes until chicken is cooked through. Remove chicken from pan and spoon sauce over it. If you desire, sprinkle fresh chopped parsley over top and serve immediately.